St. Louis Haunted Houses are some of the scariest and best in America! Hauntworld.com rates and review the best haunted houses, haunted attractions, and Halloween events in America! The Darkness is located in St, Louis, Missouri and has one of the scariest haunted houses in America! Prepare to scream! Sit back and prepare to scream through our review of The Darkness. 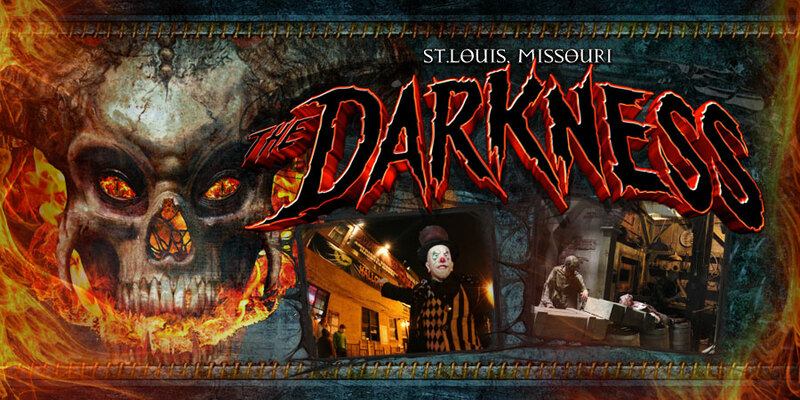 This Halloween you can't miss the scariest and best haunted attraction in the entire state of Missouri, The Darkness. The Darkness is America's Scariest and Best Haunted House located in the heart of downtown St Louis Missouri next to Soulard Market. The Darkness is full of amazing animations, special fx, live actors, unreal Hollywood level set design and has been featured on multiple television shows! Prepare to learn the history and secrets of The Darkness! The Darkness Haunted House is one of the longest running haunted houses in America and one of the most well-known haunted attractions in the World. The Darkness has operated in downtown St. Louis for over 20 Halloween seasons first opening its doors in 1994. The Darkness has been featured on more national television shows than any other haunted house in the country including The Today Show, Shipping Wars, National Geographic Channel, NFL Network, Travel Channel and even Modern Marvels. Producers of Halloween themed television shows keep coming back to film again and again at The Darkness for one reason…The Darkness is not your ordinary haunted house. We will explore the history of The Darkness Haunted House the impact it has had on the haunt industry and where this legendary haunted house is headed into the future. When the Darkness was first conceived owner Larry Kirchner was looking for a location in the downtown St. Louis area and came upon a huge boarded up building which in its heyday built everything from shoes to baby cribs. Construction started on The Darkness in the summer of 1994 located on the second floor inside this 37,000 square foot building. The first year it cost approximately $150,000 to construct the entire attraction. In comparison, this 2014 it will cost $250,000 to $300,000 to simply renovate the attraction. In its very first season, the Darkness was named the best haunted house in St. Louis by the city’s major daily newspaper, The Post-Dispatch, and 20 years later in 2013 another newspaper, The Riverfront Times, confirmed The Darkness is STILL the best in St. Louis. The Darkness has set a standard for St. Louis haunted houses which has become difficult for even The Darkness itself to match, creating a market of haunt critics who know if and when you change something, if it was or is scarier than previous seasons, and if the length was or wasn’t increased. There is a lot of pressure each year on the crew of The Darkness to meet the expectations of their own customers, but time and again they not only meet but exceed those expectations, setting the bar even higher. In 1994 when The Darkness was being conceived, the creative team (known today as Halloween Productions) struggled with names for the attraction. John Denley, a friend of owner Larry Kirchner, recommended Professor Orbs, and while Larry toyed with the idea, even asking a local artist to see if a logo could be developed, that name was abandoned rather quickly. From there a massive list was brainstormed on paper and included everything from “Nightmare this” to “Nightmare that”. This proved harder than naming one’s child, until one day during build-out they came across a story about the building referring to it as THE SUNSHINE FACTORY. The irony was obvious, considering the building was completely boarded up and in complete darkness, but on the back exterior of the building, there it was again, painted on the building THE SUNSHINE FACTORY. The huge building featured over 400 windows to allow ample sunlight for factory workers back in a day when electric wasn’t available. The name at that point became obvious. What was once a sunshine factory is now a factory of complete darkness and THE DARKNESS name was born. The Darkness experienced instant success attracting nearly 30,000 guests in its first year, and in later years would reach nearly 50,000 per season. The year after The Darkness was opened, Kirchner visited Spookyworld, a haunt owned and operated by David Bertolino which featured a horror museum, multiple haunts, a hayride, gift store and several Special Event nights with horror movie actors signing autographs. Soon after, Halloween Productions decided to develop its haunted attraction into The Darkness Haunted Screampark which included 13 holes of Horror Mini Golf, a horror museum, Horror Celeb Nights, an arcade, a horror theater, nightly magic shows and even a carnival at the exit. Sadly, the old Sunshine building where The Darkness called home was eventually sold for renovation into an apartment complex. Halloween Productions bought the smaller building next door, and ever since The Darkness is and always will be its permanent resident. However, the new building was only 20,000 square feet, and could only house The Darkness Haunted House. No longer could they fit all the elements of their Screampark style haunt. Halloween Productions additionally builds attractions World Wide, and they needed more space. So in 2009, they built an addition to their building adding 16,000 square feet more! The building addition would cost in excess of $600,000, but it added a much needed work space for Halloween Productions AND helped bring back elements of The Darkness by adding a horror museum, a gift store and a new attraction called Terror Visions in 3D. 2009 brought many new exciting twists to the legacy of The Darkness Haunted House. Transworld, the producer of the Halloween retail show, announced they would produce the first ever Haunted Attraction Industry tradeshow and it would be located in St. Louis, Missouri in March of ‘09. This Haunted Attraction tradeshow would bring over 5000 haunted house owners, operators, amusement parks and entertainment facility managers to St. Louis to buy everything from animations, props & special FX to masks & costumes and even complete haunted houses. This allowed an opportunity for The Darkness to open to the haunted house industry that March. Opening for the haunt industry brings a lot of pressure with the customers being haunt owners themselves. The tradeshow, now located annually in St. Louis, forces The Darkness team to constantly raise the bar with over-the-top renovations, spending in excess of 2.5 million dollars to build custom & never before seen FX like the now famous Swamp House room, the Falling Barrel Wall scene and the Ice Scream Truck, plus all the Hollywood level scenes and horrific sets. Many of the biggest prop and animation companies in the industry have also joined the fray to help The Darkness exceed expectations yearly. These companies too have the opportunity to showcase to haunt owners their amazing props and animations showcasing them IN ACTION inside The Darkness! Companies like Unit 70, Gore Galore and Ghost Ride are some of the main companies who have invested the most time to create mind blowing animations and more for the annual DARKNESS haunt tours (www.TheDarkness.com). What makes The Darkness so well-known across not only St. Louis or even the haunt industry but WORLD WIDE? Because of its innovation in technology, set design and marketing, The Darkness annually welcomes visitors from across the World and even celebs have visited. The entire crew of the Miley Cyrus tour and the entire cast of Phantom of the Opera have visited The Darkness, plus they’ve hosted several horror celebrity Event Nights with guests like Elvira, Linda Blair, Robert England, the late great Bobby Boris Picket of Monster Mash Fame and more. With over 20 years in haunting, The Darkness has seen a lot of things change from trying to find good latex masks to life-like silicon monsters, from using endless loop cassettes to digital audio that you can trigger upon command. Technology has greatly changed not only The Darkness but the entire haunted house industry, and The Darkness has always been at the forefront of those changes. The Darkness was the first haunt in the industry to create and utilize computer generated special FX, also known as CGI. Halloween Productions was the first company to offer multi-motion animations for sale to the haunt industry and through that experience was one of the first haunts to have a massive amount of animations within their haunt. The Darkness has been the site of over 30 produced how-to videos sold to the haunt industry with instruction on how to build sets, create gore scenes, operate a successful haunted house and more. The biggest selling how-to video of all time in the haunt industry was filmed inside The Darkness in 1995 called How to Create Your Own Haunted House which sold over 50,000 copies worldwide. The haunt industry knew of The Darkness in St. Louis even before the internet, but now it’s come to know the attraction on a personal level thanks to the Transworld Halloween and Haunt Tradeshow. Because of the tradeshow, The Darkness crew spends at least two to three times more time and more money redesigning their attraction annually than if the show was not located in St. Louis due to the immense pressure to open to the haunt industry. Every year as the Transworld show nears, the long hours and tensions increase towards efforts to create something unexpected for the industry to marvel. Halloween Productions crew members admit the environment can become tense. It’s not easy opening for the haunt industry. Every year, The Darkness crew wants to amaze their guests and amaze themselves too, and the time frame to rebuild the attraction from November to March is a tall order. Every year they build new sets, scenes and special FX plus work with vendors for new creations all while trying to additionally build their booth and decide what to exhibit new at the show. Everything adds up to a real life reality show. To even have a chance to open in time for the haunt industry by March, Larry Kirchner must start planning his renovations prior to even opening for the Halloween season in October. “When I see The Darkness over and over again trying to open the haunt for Halloween season, and when I walk through thousands of times perfecting and fixing things or checking on actors during the season, I start to see and realize the scenes I want to replace. The crew and I figure out early in October, sometimes even September, which scenes must go. Typically, it’s around 2-3 rooms on the first floor, another 2-3 on the second floor of The Darkness, some renovated existing scenes, plus new scenes for Terror Visions 3D and some new monsters for the horror museum. Any scene that is left as-is must be a scene that the haunt industry might feel is worth seeing again, and that isn’t easy,” says Kirchner. The Darkness has more in store, more to offer than ever before, but the World around us has changed and even as The Darkness changes its themes, scenes and FX, the haunt itself needs to evolve in an ever changing World. The marketing of a haunt use to be so simple; now everything has changed. The owners of the Darkness feel their haunt needs to evolve more from the marketing and promotion side to find new customers and get them excited to attend the haunt than ever before, because it’s hard to reach target audiences in today’s world. “No longer can you get by simply updating or changing your haunt,” says Kirchner. Moving into 2014, The Darkness is undergoing a massive renovation for the Haunt Show and the Halloween season which will include some of the most amazing stunts, special FX and scene designs EVER attempted, but it doesn’t stop there. Once the scenes are done, the paint dries, and the animations have been tested, it’s time to re-energize the fans with clever ways to market this St. Louis haunt. The Darkness hasn’t attracted crowds nearing 50,000 in a decade. Ticket prices have risen sharply and competition from a multitude of entertainment has embraced this new generation. The Darkness plans to not only renovate the haunt itself but renovate its approach to marketing too. They intend to create the most unique promotional vehicle ever, complete with computer FX and more. The implementation of an Actor Troupe will emerge to do parades and events. They will develop new logos and create aps to help promote the attraction. In many cases, they intend to get back to the basics with efforts towards getting their haunted attraction in front of real people the old fashion way. The Darkness Haunted House is one of our industry’s greatest haunts. It’s blazed its own trail of innovation, something that has been rewarded with 20 plus years of scaring people. The Darkness is filled with breathtaking scenes, millions of dollars of special FX, props, animations, one of a kind scenes, gaps, scares and screams. Plus, there’s Terror Visions 3D, an add-on haunted attraction found after completing The Darkness Haunted House. Terror Visions has been hailed by the industry as the best blacklight 3D haunted house in the industry. For this attraction too, the Halloween Productions crew continues to strive to innovate, improve and go over-the-top for the haunt industry every March during Transworld’s Haunt Show. Will The Darkness one day close? Because The Darkness continues to reinvent itself for an ever changing community always looking for new forms of entertainment, its longevity is secure. The Darkness is and always will be trying to stay ahead of the curve. Truthfully, The Darkness may never close, because Larry Kirchner has handed the haunt bug down to his own kids, and they dream of a day they can put Dad into retirement, so they can take over. True story! Realistically though, all great things come to an end eventually, but The Darkness like many other long lasting haunts such as Edge of Hell in Kansas City and Haunted Schoolhouse in Akron seem to be woven into the fabric of their community. The Darkness will open for the Transworld Show March 20-23, 2014. The newly renovated Darkness will include several new scary scenes including Medusa’s Lair with a fully animated Medusa character masterfully created by Unit 70. The new Bone Muncher Monster scene will feature a room of bones with one giant animated bone munching monster created by Gore Galore designed to touch, grab and eat the guests. Upstairs, The Darkness will feature three massive new haunt scenes including the coolest most high-tech decrepit bathroom ever attempted, a room with an animated actor ridden wheelchair that storms down a staircase, and a must-see scariest haunt scene called Sawzilla with a special effect that might just be the most talked about FX of the year. Sawzilla will feature an enormous destructive saw carved through the ceiling designed to terrify haunted house guests as it cuts everything in half! The Darkness is trying to become more interactive and more extreme in 2014 by creating extensions for actors and animations designed to touch and engulf every horrified victim. The Green House scene is also being renovated. They’re building a massive Venus Fly Trap that you actually walk THROUGH, but once in the middle it attempts to swallow you whole.